Welcome to LoopTeeLoops! Here I post crochet and knitting patterns - most of them free. © Tessa D'Achille 2017. Powered by Blogger. I've been wanting to post this pattern for a while! I started this blog with the three original Kanto starters, but never quite completed the set. With today's pattern you can finally make Pikachu! Attach felt details (stripes and cheeks), and sew on tail, ears, arms, and legs. Enjoy the pattern, and if you have any questions feel free to ask! Want more patterns? A pattern to make this guy is available on my Patreon right now. 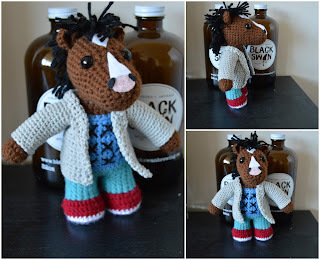 Back in the 90's he was in a very famous TV show. Now you can add the felt details as seen in the picture. For the eyes you can either use safety eyes like I did (12mm), or use felt. I looped black yarn through the stitches, and fastened it off. For you, you want to have the legs be 17 stitches. That means there will be one extra (with your round of 35). I just left it in the middle, and sewed it closed once the legs were done. Repeat this for the other leg, and then stuff the body from the neck. Sew the head onto the neck. At this point you can also embroider the black X's onto his sweater. Stuff the arms, and sew them onto the body. Now you have a rectangle that should wrap around his body under his arms. You're going to crochet a smaller rectangle on the top of this, that will sit between his shoulders. Row 15(ish): Count 13 stitches (we're crocheting across the wide part of the rectangle), and put your hook into the 14th. Sc 11 starting there. When you finish, there should be another 13 stitches left on the other side. Now you should have a raised rectangle on top of your larger rectangle. Now you're going to direct your attention to those two lower spaces with 13 stitches. You'll be sewing it to the other side (the other 13 stitches that you didn't start on) Starting on the edge, sew your work to the 7 stitches. Count 12 rows, in the 13th sew across the 11 back stitches. Really, you just want to be sewing the middle of this piece to that raised rectangle. Those 6 stitches on the large rectangle that weren't worked/sewed in are now the openings for the arm holes. Row 1: Crocheting onto the arm hole space, Sc 17 around. Weave in all ends, and sew the lapel and collar down. 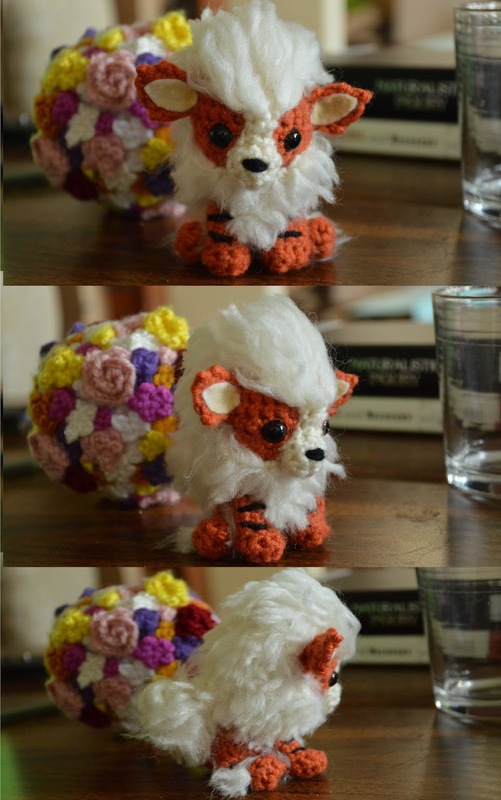 This week I'm giving you guys a pattern for Growlithe! This tiny, adorable little Pokemon would look perfect sitting on your desk or shelf, and is incredibly easy to make to boot! For this one, you'll have to be at least mildly comfortable with embroidery, as the stripes are embroidered on. Additionally, get ready to be patient. The fur takes forever to attach on. Now you're going to place the safety eyes in-between rows 6-7 in between the two increases. Count in 2 from each of the increases, and place the eyes there. The decrease shaping will create a paw shape. Sew arms/legs, nose, and ears onto the body. You're going to make a base for the tail, so you don't have to use roving for all of it. Sew the tail onto the body. Now for the fun part - the fluff! Using a hot glue gun, pinch small pieces of the roving, and stick them where they're supposed to be. It works, and it's quick! You just have to be careful with the glue, as it can look very messy if done badly. This week you guys get two patterns! I haven't been posting for a while, so I decided that I would re-boot my blog by making two posts. The first is this adorable bumble bee pattern. This pattern is actually the first pattern I've ever written. It's been sitting in my patterns folder forever, so I decided I should go ahead and share it! It would be perfect for a nursery decoration, or as a rattle if you add a little shaker inside. I hope you enjoyed making the pattern! There's a thing I think all of you need, and that's a tiny Merc With A Mouth plushie. 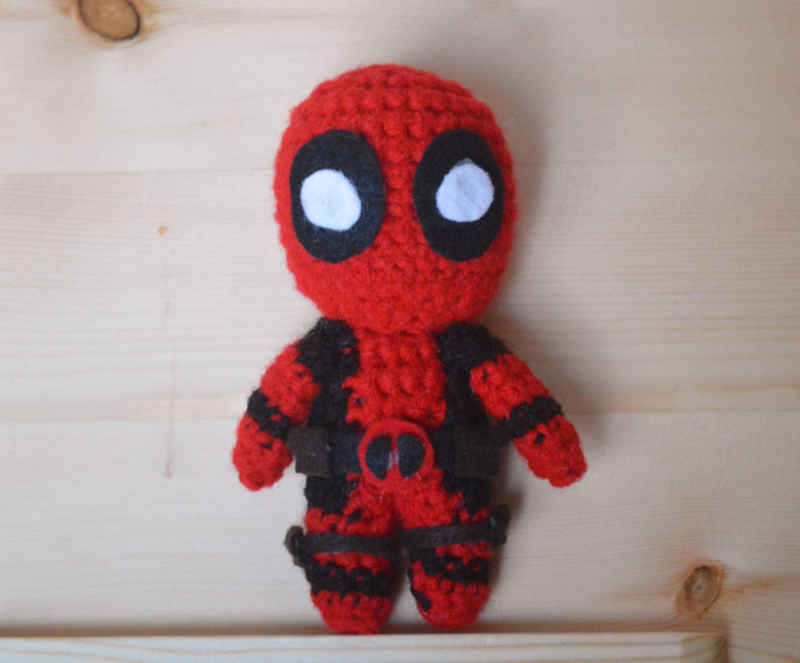 Yup, for this week's post I've written a Deadpool pattern! Anyways, without further ado, here's my Deadpool pattern! This decrease will create the shape for the front and back of the head. working yarn. You can find lots of tutorials on Youtube if you’re unsure of how to properly switch the yarn colour while crocheting. <— As you can see by this picture, I’ve put a SC into the first red SC of row 1, making a loop to build the leg off of. Row 6-close: *SC DEC* x 2, *Slip stitch DEC to close*. FO. Row 7-close: *SC DEC* x 2, *Slip stitch DEC to close*. FO. Sew the arms right under the neck, at the sides of the body. I cut two small egg shaped pieces out of white felt, and two large ovals out of black. rectangle, and folding the top over and gluing it down. I also put two smaller belts on both legs, with one pouch on the side of each one. Glue everything on, and weave in any loose ends, and you're done! A while back I got a request for a tiny Cubone, but all of the patterns available weren't really my cup of tea so I wrote my own! I had been meaning to put the nearly nonsensical scraps of pattern notes into a legible pattern for quite a while, so I finally sat down and forced myself to write. *Note that this pattern is still kind of a rough copy; I don't have too much time for pattern writing this week. Each new line is a new row, unless it says to do __ for __ rows. Don't FO, you'll be making the body once you attach the eyes. CH 2, SC 9 into 1st CH. (Or make magic loop and SC 9 into that, leaving the loop loose enough to fit the safety eyes. Sc x 9 around, FO. Put safety eyes through the center. Fasten eyes, and stuff the head. SC 6 in magic loop. CH 2, SC 7 into 1st stitch. SC 4 in magic loop. Sew the horns, fangs, nose and face bones on using the pictures provided for placement. Sew on the arms, legs, and tail. Sew the bone onto one of the hands. With some black yarn, embroider the nostrils. Hello! I'm Tessa, the owner and creator of LoopTeeLoops. Here you'll find patterns (some paid but many free! ), the documentations of my crochet and knitting adventures, and the odd cat picture. Welcome, and if you like what you see, please subscribe! First Post and First Free Pattern! An Early Post With Some DIY Valentines Day Gifts! © 2015 LoopTeeLoops. Victoria Template designed by Georgia Lou Studios All rights reserved.